Microwaves, toaster ovens and tabletop Convection ovens are popular and useful appliances in the modern kitchen, fortunately Bertazzoni offers an option that clears the clutter by combing all the great tools that each of those appliances offers in one stylish built-in wall oven available in either 24 or 30 inches. The benefit of the Bertazzoni Speed Oven is that it offers six Cooking Modes to help you achieve perfect results with every type of cooking. Microwave Mode – the 1,000 watt microwave can be used in the Sensor mode for cooking and reheating or customized and used at lower power output for perfect cooking, heating or defrosting of more delicate foods. 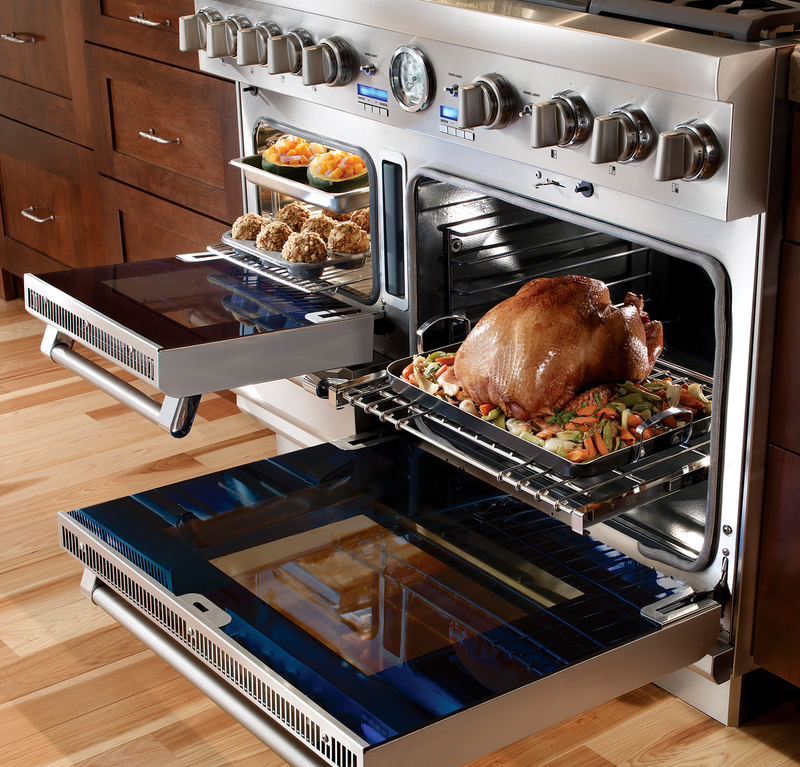 Convection Mode – a small second Convection oven is one of the must have tools of the modern kitchen, great for cooking smaller quantities of food and for back-up space when the main oven is in full use. Combination Convection + Microwave Mode – this mode uses the Convection element to cook the food combined with lower wattage microwave power to speed up the process, the perfect tool for a busy lifestyle. Broil Mode – this mode is ideal for toasting bread and bagels as well as broiling meats, fish and vegetables or browning casseroles. Combination Microwave + Broil Mode – this mode uses the heat from the Broil element to cook the food with lower wattage microwave power to speed up the process. Combination Convection + Broil Mode – this mode is ideal for broiling thicker cuts of meat or fish as the Convection inhibits the drying of the food as it cooks with the powerful direct heat from the Broiler. "The Bertazzoni Speed Oven combines a 1000 watt Microwave with a Convection Oven in a sleek built-in design, available in 24 and 30 inches." If you’d like us to contact you about new products and offers, share your email below. Or, for updates more relevant to you, give us a little more information.